By now nearly everyone has heard about “normal” 3-D printers, but 3D Bioprinters? It is seldom that one product, in and of itself, says so much about where technology and humans are headed in the future. 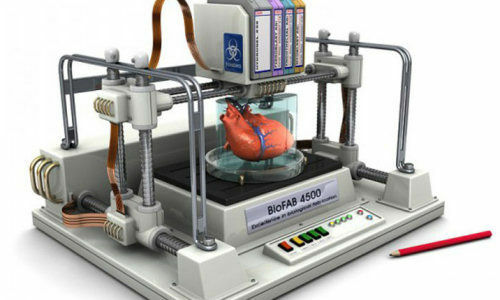 Bioprinting technology will allow doctors and scientists to print synthetic tissue and entire human organs. This will undoubtedly be a medical revolution with all kinds of ethical issues swirling around it. A typical inkjet printer sprays different color inks onto the flat surface of paper. Bioprinters, on the other hand, will be loaded with cartridges of primary or other living human cells and move in three planes allowing it to fashion 3-D tissues and organs. Cells will be laid into a protective gel and objects built up one cell at a time. Within a few hours a Bioprinter will be capable of producing a new eye, kidney, heart, liver, you name it! The company leading the charge is Organovo, a team of biotechnology and medical device experts. Organovo currently provides the NovoGen MMX Bioprinter to its pharmaceutical partners who are using them for cutting-edge research into drug discovery. A number of relatively new research concepts are converging to bring this technology to fruition: biofabrication, tissue engineering, self-assembling multicellular systems, bioink, and cell fusion to name a few. The above story is based on materials provided by industrytap.